The second edition of the popular San Francisco Bay Shoreline Guide is the one essential book for anyone who wants to explore the remarkably diverse San Francisco Bay shoreline. 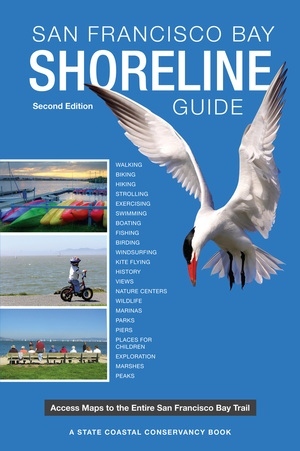 Comprehensive, compact, user-friendly, and studded with full-color maps and illustrations, the Guide covers the more than 325 miles of the shoreline Bay Trail already open to the public, a corridor that will eventually encircle San Francisco and San Pablo Bays with a continuous 500-mile network of bicycling and hiking trails. The Bay Trail offers access to commercial, industrial and residential neighborhoods; points of historic, natural and cultural interest; recreational areas like beaches, marinas, fishing piers, boat launches, and over 130 parks and wildlife preserves. It passes through highly urbanized areas like downtown San Francisco as well as remote natural areas like the San Francisco Bay National Wildlife Refuge. The Bay Trail consists of paved multi-use paths, dirt trails, bike lanes, and sidewalks. The Guide includes natural, cultural, and historic features that reveal the Bay Area's rich multicultural heritage. It also highlights the various ecosystems that coexist along this unique urban shoreline. Common plant and animal species are illustrated and described for easy identification. Icons indicate sites suitable for various activities: boating, fishing, biking, hiking, birdwatching, picnicking, and wheelchair riding. A reference section contains public transit information, names of Bay-related organizations, and many useful phone numbers.